Good Friday was a non treatment day. 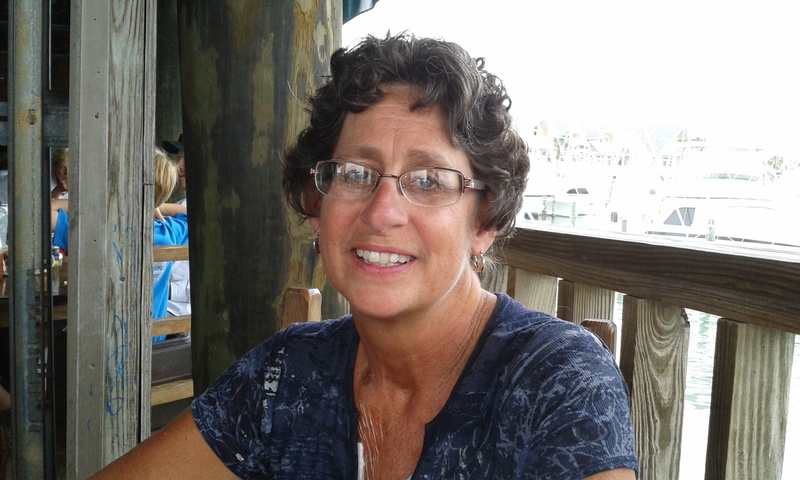 Starting Monday, Connie will do daily brain radiation treatments (save Saturday and Sunday) through till a week from Tuesday. We won't miss that daily ride into Corpus Christi. Hope to get some clarity from those at the Cleveland Clinic this coming week about her treatments in Ohio. That will help us make our return to Ohio plans a little more concrete. She's been feeling well, being active, pretty voracious appetite and really not showing any of the side effects (other than some spotty hair loss from the Cyberknife). Her chemo pills are two weeks on, one week off. This weekend was pretty much "drug free." Spent Friday night watching some hoops. Went into Rockport Saturday to look at some of the shops, then came home to watch the Buckeyes drop out of the tournament at the hands of Wichita State. Today we started our day with a special recipe for breakfast that Connie found in a magazine while doing treatments, watched a few hoops, then off to the Clubhouse for a great carry in Easter Dinner. Most everyone will be heading out (if they haven't already) tomorrow, and we'll start back for treatments to Corpus. Why are these people leaving? First about Connie: pretty easy day today. Run into Corpus for a brain radiation (her last one until Monday), and hasn't seen any side effects (knock on wood). Then there's these people at the park. What is up? 70's here for the weekend and most of next week. They're all leaving to go "back home" north where it's 30's and 40's. I don't get it. I just don't. I know there are some that have obligations, even (gasp!) work. But, for the most part, another week or so here isn't going to change anything. Just amazing. Saw it the last two years: Easter is the get home time. Period. Have a great weekend everyone. And, for those of you traveling, safe travels. So far this week has started off with good news from the doctor visits. First, when we met with the radiation oncologist on Tuesday, she decided to start stepping down the steroids to twice a day. Then, today, the medical oncologist stated that since the cardio results were good, the Herceptin dose can now go up to the normal dosage that only needs to be administered once every three weeks vs. weekly. Yippee! Also, today marked the last day of the initial therapy dosage of the chemo pill (Xeloda). Getting a rest of 7 days before the next round starts. 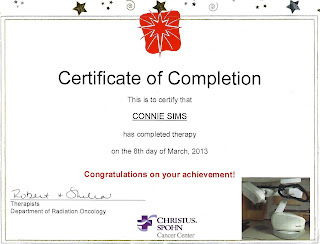 With having both radiation and injection today, didn't do much else. Felt good, but am starting to wind down as the day is coming to a close. We had an amazing weekend. 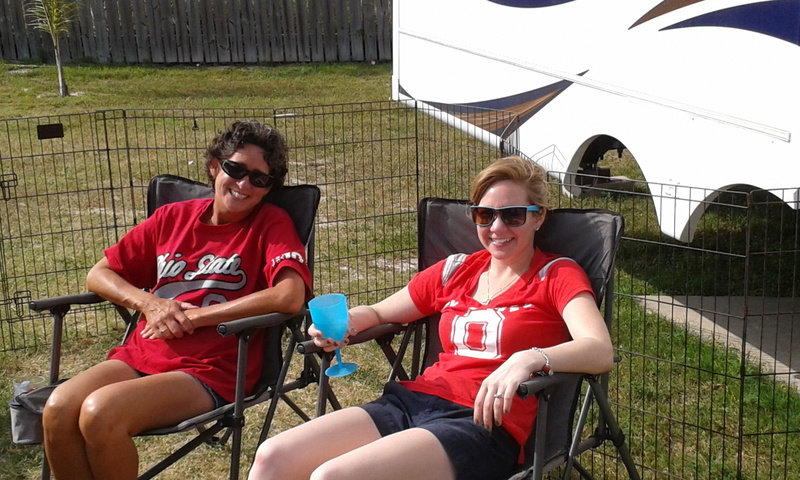 Our daughter, Bethany, and son-in-law, James flew to Houston and drove down Thursday afternoon to Copano Bay RV Resort. Connie had a radiation treatment at 8a on Thursday, then tired herself out helping me clean the rig. She was up and going again by the time the kids got to town. After a night of jabber and remembering how the sofa bed worked, we ran into Corpus again Friday morning for a brain radiation treatment and were back by 9a. We did a spin with the kids around Rockport, then a late lunch at Moon Dogs. The brisket nachos were outstanding, as were the shrimp nachos. Came back home for a day of watching college basketball, and the Buckeyes winning their first round game, while we munched on snacks and Connie's beer dip. 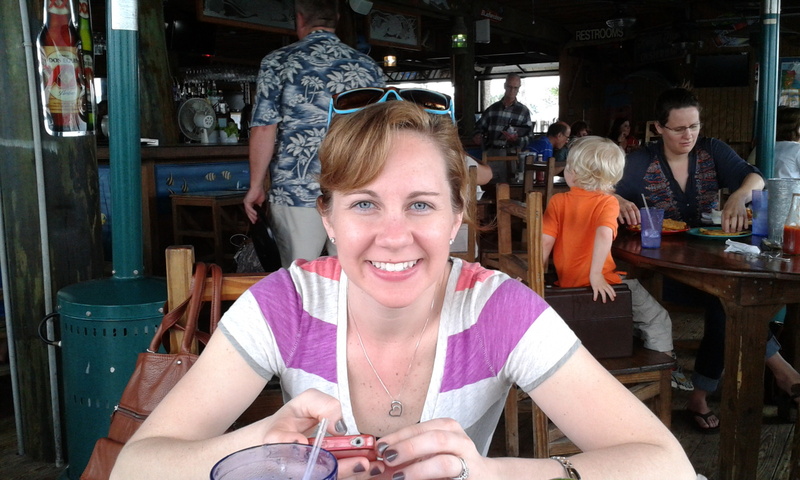 Saturday, we headed out to Port Aransas for lunch at Virginia's and I introduced Bethany to munzee hunting. The view at Virginia's was better than the food, but all in all a decent place. Drove around the town, then drove the beach. Made the circle into Corpus Christi, then ended up at Fajitaville for a cocktail. Bethany had a Beerarita and we all enjoyed the atmosphere. Had steaks at the rig for dinner and it was a pretty early evening while watching our brackets go up in flames. A word about the rig. It performed perfectly in our first weekend entertaining guests. Hot water tank had plenty, air mattress was OK, and all in all we were all very happy. Carmen and Sloopy helped Bethany and James with missing their dog. Sunday, James rolled to Victoria to golf with one of his college roommates, while the rest of us watched the Buckeyes squeak one out against Iowa State. Afterward, Connie and Bethany shopped the shops of Rockport for a few hours. Pizza Hut cooked dinner as we watched the tournament deep into the night. Connie was pretty much a fireball all weekend. Not many times we had to slow down, she was able to have a couple of Landsharks here and again. Made her very happy. Monday was the day we dreaded, as Bethany and James headed back to Houston for their flights back to Ohio. Hurts a little less knowing we'll see them again in a couple of months. Monday afternoon, back to the grind of treatments. Had tons of leftovers for meals. This morning, Copano Bay RV Resort had an incredible breakfast prepared by one of the guests who cooks (or runs?) at a bed and breakfast. Delish! Treatment afterward and a meeting with the radiation oncologist who thinks things are going along very well. Today started bright and early with our wake up alarm going off at 5:30 AM. Had to be at Christus Spohn Shoreline by 6:30 for the registration to get new hardware installed at 8:30. I now come with a Bard Power Port included. Should make the injections much easier since they won't need to use me as a pin cushion anymore. Once released from the Same Day Procedure unit, it was time to head on to the Herceptin injection appointment. Nothing like getting new hardware and trying it out right away! Just as advertised, it was quick and easy. We did see the medical oncologist today too. Just reviewed the treatment plans and finally got the mammogram results from the hospital. Go figure, they were negative. After the injection, it was time to get some much needed lunch (at 1:00 PM). Since we had another appointment in the area, we decided to go back to the Sirloin Stockade. Perfect. Knowing that it was going to be a long day, we had taken the dogs to Brunos again for daycare. A quick lunch allowed us to pick them up and make our way to the last appointment. Time for round 2 of the whole brain radiation. Quick in and out and we were on the way back home. Whew. All of us are exhausted. Time to get rested up for our company (Bethany & James). Can't wait to see them tomorrow! Oh, and I forgot to mention, this morning was the first evidence of the hair starting to go. After a very enjoyable weekend of watching College Basketball, the Buckeyes win the Big Ten Tourney and a Monday of making sure everything is in place, we returned to the treatment train today. This morning, we were in Corpus at 8a for a whole brain radiation treatment. Used the same mask as the Cyber Knife, but a different more shot gun approach to the cancer that's in Connie's brain. Whole treatment lasted about 20 minutes, then we consulted with Dr. Stewart for another 20 minutes. There's concern about using Xeloda (chemo) to treat the body cancer at the same time as the radiation to treat the brain, but it's a risk we're OK with taking. Tomorrow is going to be a tough one. In at Corpus by 6:30a (talking about a 5:15a alarm!) for the installation of the mediport procedure, a 10:00a Herceptin treatment and a 2:45p whole brain radiation procedure. I'll drop Connie off, take the girls to Bruno's for some daycare and kill the day here and there in Corpus working, walking the mall or deploying Munzees. We'll try to get a lunch in at the Sirloin Stockade again between the Herceptin and the radiation. We'll be dragging by evening (including Carmen and Sloopy). The reward will be Thursday when our daughter (Bethany) and son in law (James) fly in from Cleveland after another 8a radiation treatment. Got a big weekend planned if Connie's up to it. It was another beautiful day in the Coastal Bend. Our day started very early since my stress test was scheduled for 8:15AM and we had a 40 minute drive. The sunrise was wonderful. There were two tests scheduled today. The first was the Nuclear Stress Test and the second was the 2-D Echocardiogram. When I checked in, the receptionist proceeded to tell me that insurance companies have recently started denying payments when there are multiple tests scheduled on the same day. Really? What's up with that?! If you need the tests, why does it matter when you have them? So, since I had some down time, I called to check on this. We'll see how that all goes. Ok, all pumped up with nuclear radiation and ready to get on the treadmill. This is monitored by the doctor. My cardiologist was off today, so one of the others in the group came to monitor. A little way through the test, he asks me "What is such a healthy, in shape woman doing here?" <Sigh> I explained. Maybe I should have also told him about the fractures (rib, vertebrae, etc.). Feeling a little of the test this evening in those areas. After all the testing, we went to the Sirloin Stockade for a great lunch. We picked the girls up from their daycare at Brunos. Then, we took the long road home and headed to Port Aransas to check out all the spring breakers. Drove along the beach and enjoyed all the people watching. Back on the home front just in time for the Buckeyes game. Great win over Nebraska. Let's Go Bucks! Connie had her 2nd Herceptin treatment yesterday. Had to switch to the left arm, since the right one had been stuck enough. She's going to have to relent and go to a mediport for the future IV's. She's not happy about it, but it's what needs done. Her appetite is like that of a pregnant woman: some crazy cravings. 10 years ago, she pretty much swore off sweets, they didn't taste good to her. Steak. She LOVED steak. This time, she's getting a little bit of her sweet tooth back. Yesterday, as we're driving back from her treatment when I asked what she wanted to for lunch: pizza. Hit the Pizza Hut in Portland for the buffet and she went at it. She hasn't been experiencing the aches and pains today, her stamina has been really, really good. Honestly, if you would see her today, she'd be just like she was a year ago or any other time. Nothing really noticeable which is terrific! Tomorrow, we roll out early to Corpus for her stress test. Cardiologist ordered it Tuesday so that we can get a baseline for her heart and how its handling the chemo and Herceptin. 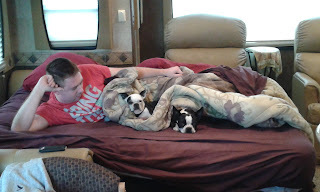 Going to take the girls (Carmen and Sloopy) to Bruno's for some day care. Time (and money wise), we're better off doing that than me dropping her off, coming back and heading back in again. Will probably get the tires rotated on the truck to kill some time, too. Our time with our friends, Fred and Vickie is rolling to a close, also. We're going to go with them to our Heartland Owner's Group tonight for a meal at Texas A1 Steak and Seafood in Portland. Then, they're out to the Island for most of tomorrow before hitting the road again on Saturday back to Dallas. Another good nights rest followed by another good day. Met with the Cardiologist this morning - we both really like Dr. Schechter. Initial look/listen and he feels the ticker is ok and up to the challenge of the IV drug we are using. However, we need to do a Nuclear Stress Test and a 2-D Ecocardiogram. These will be done on Friday and used as baseline data for further checkups. More good news - the chemo pills finally arrived this afternoon! Wow, that only took a week. Got started on them right away per the doctors orders. 14 days on then a week off. Bob joined in on the jam session tonight at the park. Our friends and I went to listen for a little while before heading back to grill the dinner. Nice being able to spend time with our friends again. Tomorrow is the second dose of the Herceptin. Hoping the side effects from that will remain very little like the first dose. Enjoying the sunny, warm weather. Labels: Copano Bay RV Resort, Weather. Nice day here in South Texas. Woke up to cool temps (low 50s), but sunshine. Bob had to go take care of the "check engine" light issue with the truck. It ended up not being covered by warranty, so he was able to get in to a local garage and get it taken care of first thing. He was back in time for lunch. My morning was once again spent on the phone with the prescription insurance company asking why I still did not have (and would not have) my medication today. UGH!!! They say, it will be delivered tomorrow - heard this for a week now, so we'll see. He also put in a very full day of work for the travel agency. Being busy is a good thing (for several reasons). Since I was feeling pretty good today and the sun was out (warmed up to low 70s), we spent the afternoon outside visiting with our friends. Soaking up the sun while I'm still allowed to do so. 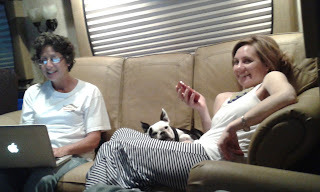 One of our friends from the rv.net Kerrville rally stopped by to see us today. Was a short, nice visit with txbobcat. Our friends are cooking dinner tonight. Nice change of pace for us both. Right now, just watching what looks like to be another awesome sunset over Salt Lake. Tomorrow will be the visit to the cardiologist. Thanks again for all the prayers. They are much appreciated! Another day, another day we didn't make it to the Oyster Fest. Guess we'll have to see it next year. Played it smart on springing forward, went to bed last night on "tomorrow's time" and got up about the normal time. Had some impossibly easy bacon pie for breakfast. Took a little long to cook, but boy was it worth it. Broke a string last night in our day/night shades (we're getting good at replacing them, but really? This is our third one breaking! ), and spent the rest of the morning replacing it. After watching the Buckeyes beat the Illini, we headed to the clubhouse here at the park for an ice cream social. Good ice cream, but better conversation with some of the others in the park. Came back to set up the outside TV. Watched the end of the golf tournament and the Wolverines gag away a Big Ten co-title for Ohio State while our friends Fred and Vickie came to town with their grand daughter, Maddison. You can see how we met Fred and Vickie here. Amazing the friendship that we've developed over a little more than a year. Kids are the same way. As soon as they pulled in, Maddison met the little 9 year old (Emma) on the other side of us and off they went. We shared our grill and ate dinner at our place, then enjoyed each other's company till it "was time". Connie took it easy today. A good nap for around an hour and some sunshine time kept her happy. Not many aches and pains, just had some ups and downs as far as energy throughout. No more appointments till we meet the cardiologist on Tuesday. What should have been stress free, relaxing Saturday has turned into anything but. Spent the morning on the phone with either Curascript, the Doctor's Office and Xpress Scripts trying to get some answers. Apparently, when the doctor placed the order for Xeloda (the chemo) with Curascript, she also placed an order for Ondansetron. Xeloda was approved by insurance, but the Ondansetron was a quantity the insurance wouldn't allow. Since they were both on the same order, no can do. We get nothing and (try to) like it. Furthering the complications are the doctors are all on spring break. Let's go relax and take the dogs to the local Dog Park. Nothing we can do about the meds, so we'll try and control what we can control. Why is the "check engine" light on in the truck? Got to be kidding me. Took it to O'Reilly's for diagnostics and there's an issue with the glow plug circuits in cylinder #3. Sensational. Reading the forums, there either has or hasn't been a recall for this. So, we'll have something to do on Monday now which should have been another day off. Rains it pours. The park is going to have a cook out this afternoon, then we're going to check out the Oyster Fest. Our friends Fred and Vickie are supposed to be pulling in with their MH later tomorrow. 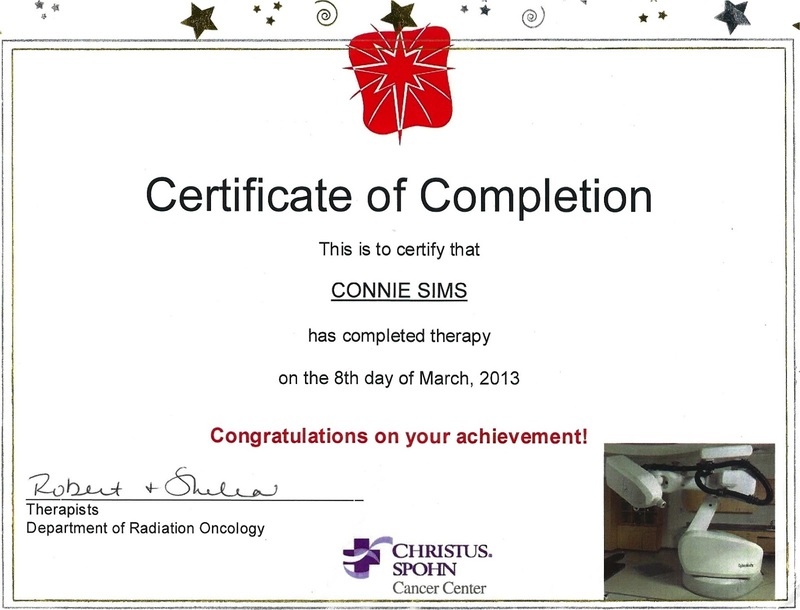 We had a late appointment today (2:30p) Connie's final Cyber Knife treatment. Even though they were running late, and the system reset a couple of times, things went very well. The staff even gave her a little certificate of completion. Getting a little upset with CuraScript about one of the meds. One of my pet peeves when I was teaching was a student who would see me in the hall late in the day to tell me they weren't going to be at rehearsal. I just had them for 45 minutes two hours earlier. Were they waiting in the hall all day for me to come by to tell me? Getting the same thing with this deal. We keep getting automated calls that everything is on target and we don't need to do any more to receive the meds. The meds didn't come today. We call and they tell us we need to do X, Y and Z. Getting a little frustrated. Since we ran a little late, dinner in wasn't an option so we went to Alice Faye's on the Bay. It's Oyster Fest weekend here in Rockport-Fulton. We'll try and check that out tomorrow. No appointments until Tuesday. That will be a relief. Today, we were over to Dr. Stewart's office (radiation oncologist) for a 10:30a appointment with the second round of the Cyber Knife. They were running a little behind, so she actually didn't get in until 11:15 for the 60 minute treatment. Everyone, again, was very happy with the results. We decided on Joe's Crab Shack for lunch. The Corpus Christi location on the bay has a beautiful view. 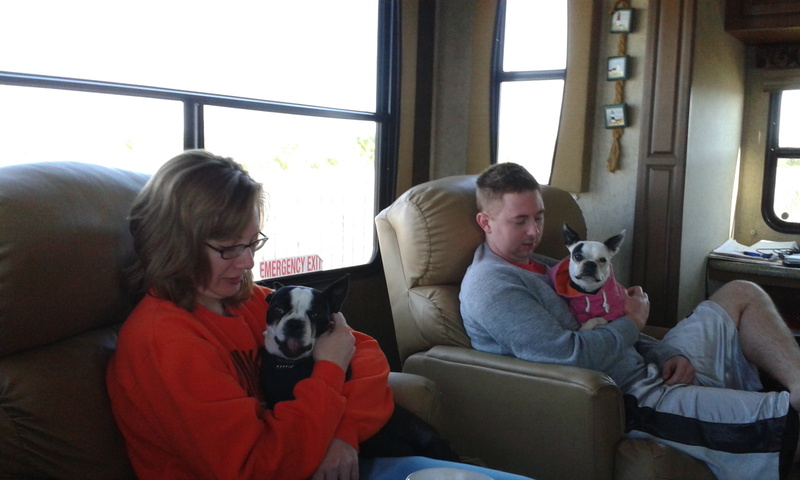 After lunch, we ventured over to Portland and Sea Breeze RV resort to visit our friends. We got to meet Sadiee, Justin and Kristie's new boxer puppy. There's nothing better than 'puppy therapy'. It was great to see everyone again, and catch up on the park scuttlebutt from the last month. After we returned home to Rockport, Connie was whipped. Doesn't "hurt", but just not much energy. Tomorrow, our final round with the Cyber Knife. Connie met with Dr. Stewart in the morning and underwent the first (of three) treatments with the Cyber Knife. Everyone was very happy with the results. It was double header day, as she then went to Dr. Aponte's office for her first weekly Herceptin treatment. This should be a once every three week dose, but because of the heart risk, it was decided to give her a third of a dose for the first three to see how the ticker responded. After all the treatments, she was in very good spirits and seemed physically very good. Around 7p, she started winding down. Once she goes, she goes quickly. We met with Dr. Aponte Monday. She did confirm that it was breast cancer, but that it was going to be a long haul. Connie would be on chemo for the foreseeable future. It's going to be in a pill form, while she'll receive Herceptin through an IV. Her treatments back in 2004 did do some damage to her heart. There is a risk that the Herceptin could further that damage. We're going to have to add a cardiologist to the team in the near future to monitor that. We decided that we would do our "first round" here in Corpus Christi, then transfer back to the Cleveland Clinic. Not quite sure how that transition is going to be handled, but we've contacted Dr. Andresen's office in Cleveland, and both oncologists offices have been in contact. Dr. Aponte requested all the 2003-04 records, while forwarding all the current records. Connie and I decided the best plan of attack was to go back to Kister Marina in Ashtabula and stay the season. Then, in October, we'll return to Corpus Christi to keep the continuity of doctors. It's almost like we're snowbirds, but without a sticks and bricks house. We contacted Kister's and they did have availability for a seasonal spot (May 1 through Oct. 15) and we sent our deposit in to hold it. First, the brain masses which are scheduled for Wednesday and the Cyber Knife. Our friends Fred and Vickie came down from Dallas on Thursday. They didn't bring their MotorHome to our park, rather they stayed in the "not a hotel" Days Inn. We had beef BBQ waiting for them when they got in. They stayed a little while, but everyone was tired and we called it an early night. Friday, Connie's 50th birthday, she got fitted for her Cyber Knife mask in Corpus Christi. This is just basically a mesh hard mask to keep her head still and enable the Doctor to be consistent with the radiation lasers. We came back to Rockport, met with Fred and Vickie and went to the ChartRoom for dinner. That turned out to be just a beer. It was a beautiful view, but too cool for everyone. Off we went to Hemingway's in Rockport. There was some babe setting up for karaoke and a few tables in the bar and NO ONE in the main dining room. Food was decent, a little overpriced for the portions. Karaoke babe kicked up about half way through the meal and ambience went right to hell. I couldn't eat fast enough to get out of there. We asked our waitress where a good place to go with live music would be. You know, for people your age (she was low 20's). Her response: "People my age are an endangered species in Rockport." Very funny. But true. She told us about the Sugar Shack which she thought was going to have a live band on Friday nights. What a great dive. Age range was 20 to 75. RV'ers, locals, fisherman. Very diverse. Connie was wearing out, so it was one beer and done. Didn't get to hear the band, but we'll try it again someday. Saturday was Belt Sander Races at the Pickled Pelican. What a hoot. Played a little (free) shuffleboard after the hotly contested races (J.D. Greene won the modified and we saw a track record), then picked up a couple of Little Caesar's for dinner at the rig. Connie retired early, while Fred, Vickie and I played a hotly contested game of 3 handed hearts. My ribs hurt from laughing so much. Sunday, I paid for the over indulgence and felt bad for my friend Fred (who felt as badly as I did) but had to drive back to Dallas. I think Connie was more active than I was today. It was a great diversion from what had been going on and we're both thankful for such great friends.